Finding the best mindset to challenge your spending and your debt can take a bit of effort but it’s definitely worth it. Living in a society where credit is easy to get and we’re encouraged to buy more to be more… happy, attractive, successful. It’s easy to see how many of us find ourselves with credit card balances we can’t clear at the end of the month or perhaps, ever. If your debt is getting out of control, it’s time to face reality. Drag that debt out into the light of day and deal with it, once and for all. Too many of us have debt we either don’t admit to or are unsure of the total amount. Time to face the facts and get clear on exactly how much and what type of debt you have. As is often said, you can’t resolve a problem until you first acknowledge it. Don’t wait for your creditors to stage an intervention, create your own. This also helps you build your personal responsibility mindset. This is the best mindset for not just getting out of debt but also staying out of debt. Grab a piece of paper or use a spreadsheet and list out all your debts; credit card, car loan, student loans, department store cards. Everything. You cannot afford not to know these details. You wouldn’t be human if you didn’t feel a few emotions rise to the surface when staring at the sum total of your debts. There’s bound to be a measure of guilt, regret, anger and maybe a little shame, too. Take a moment to feel whatever it is you’re feeling. The best mindset for dealing with clearing your debts is an honest one where you accept responsibility. If you’re stuck in a blame mindset, you’ll find it very hard to break the debt cycle. Don’t try to sweep any of those emotions under the rug, acknowledge them so you can move on to the next phase. This is also a good time to think about why you accrued the debt. Was it an out of control spending habit? Maybe you were out of work and had to live off your credit cards? Whatever the reason, resolve to avoid it happening again. Some of us learn best by making mistakes. I count myself among that number. So, consider this debt a lesson learned and move on. It might seem counter-intuitive to grow an emergency fund before paying off your debts but the simple truth is, if you’re in debt, it’s probably because you had to rely on credit rather than savings to get through an emergency. Even if it was a “shoe emergency”. In order to reduce your debts once and for all, you need an emergency fund first. This is the personal responsibility mindset at its best. Dave Ramsey states in his seven baby steps that you should aim for a $1000 emergency fund before beginning your debt pay down plan. That’s a good starting amount for your emergency fund. Find the extra money to put toward your emergency fund by going on a spending freeze, making some extra money on the side or just taking your lunch to work each day. It’s important to remember to keep making your regular repayments for your debts while building your emergency fund. Now you’re building your emergency fund, you need to organise a game plan for paying off your debt in the most efficient (and preferably painless) manner possible. That means, sorting out your budget. Once your emergency fund hits $1000 you can start putting the money you were saving each payday for your emergency fund into your debt repayment plan. You might also take the time to plug any leaks in your budget, like excessive spending on entertainment or clothing or eating out and channel those funds toward your debt, too. Choosing which debt to start with depends on your personality; do you like to see quick results or can you delay that gratification? If quick results are your thing, choose the lowest value debt and pay it off first. If you’re happy to take a longer view, focus on the debt with the highest interest cost. As you pay off each debt, direct that payment toward the next debt on your list. Now you’ll be paying the original payment plus the one you were paying on the other debt. This is called the snowball method. As each debt is paid off, your debt repayment amount snowballs. And, your debt repayment gathers momentum. 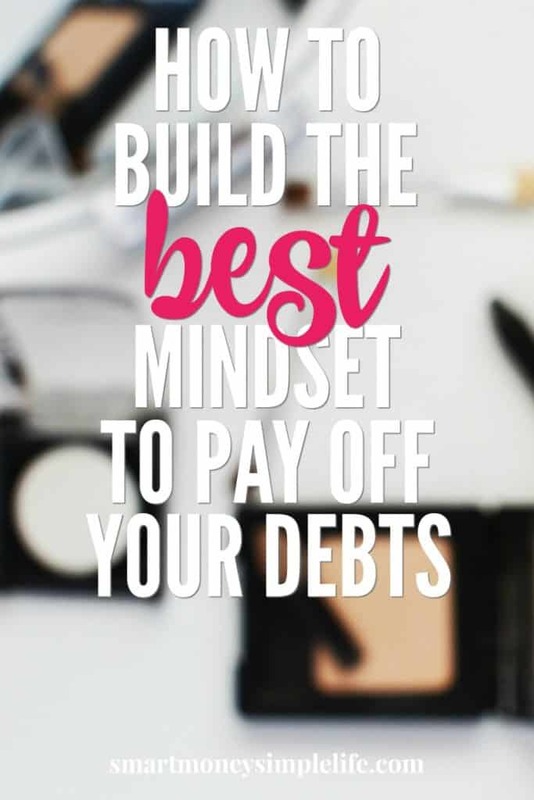 The debt you currently owe can be a temporary setback and eliminated entirely by building the best mindset to combat debt and that’s taking personal responsibility. Make sure you continue to maintain that mindset so you don’t fall back into the old behaviours that initially created your debt. If you have a shopping addiction, deal with it or you will be back in debt again before you know it. If your income is erratic, look for ways to create other avenues of income, like a side hustle. Create and stick to a budget, allocate yourself splurge money so you can maintain a positive mindset and keep saving. Celebrate your wins along your debt repayment journey because they really are worth celebrating. Your long term success depends on changing your mindset from the one that got you into debt, to the best mindset to keep you out of it once and for all; personal responsibility.